For many generations the skeletal like carriages or cars of Volk’s Railway have run along Brighton Beach carrying excited children and the young at heart to Children’s Playground and Black Rock. Opened on 4 August 1883, the creator of this popular railway was electrical pioneer Magnus Volk. Owners of seafront shops and beach traders alongside the route feared the railway would drive away their customers, and the residents of Kemp Town were vocal in their oposition. But with the passing of time, the sight of the cars on their way to and from Black Rock became a familiar part of beach life, and once hostile residents embraced the railway, believing it to be an asset to their town. As part of his transport plan for Brighton seafront Magnus Volk also built a railway in the sea. Nicknamed Daddy-Long-Legs, this curious hybrid of boat and pier ran from Black Rock to Rottingdean from 1896 to 1901. 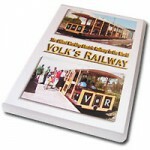 Volk’s Railway was the first electric railway to be constructed in England. It’s quite a modest little railway but it was once part of a much grander scheme, for there was a time when Volk’s railway ran all the way along the coast to Rottingdean, and it was very unusual because the track, for the most part, was under the sea, and the carriage travelled above the surface of the water on long ‘stilt like’ legs. Much of the track has been obliterated by the building of the Marina but there are still remains to be seen a little further to the east. The track is only exposed at low tide and this must have posed quite a few problems for its construction. The time that you get to explore down here is quite limited so it must have been the same for the builders of the track. The trip would start from the Banjo Groyne at Kemp Town and then proceed to Rottingdean at not much more than a walking pace for which you would be charged the princely sum of sixpence each way.Magnus named his creation the ‘Pioneer’ (soon nicknamed Daddy Longlegs) and it proved to be a great success with his public. Sadly though, it only ran for a very few years, mainly due to the fact that it was operating in such a harsh environment, but its memory lives on. The Devil’s Dyke, a deep gorge in the South Downs five and a half miles north west of Brighton, began life as a tourist attraction as early as 1818 when a small wooden hut was erected on the adjacent Dyke Hill. In the 1830s a Mr. William Thacker built a hotel on the site, and in later years an adventurous proprietor named James Hubbard took over and increased the facilities to include a bicycle railway, roundabouts, swings, a brass band and all the fun of the fair. He also opened two unusual enterprises; an Aerial Cableway and a Funicular Railway. An essential part of a day out at the Devil’s Dyke was the ride on the Brighton and Dyke Railway. 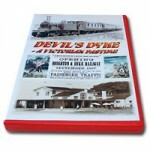 The standard gauge line enabled visitors easy access to the Dyke, and during the 1890s James Hubbard’s amusement park was one of the most important tourist attractions of South East England. 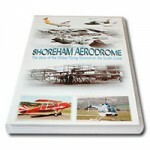 SHOREHAM AERODROME, known today as Shoreham Airport, was the birthplace of aeronautical heritage in the South East of England. There have been many a famous aviator flying to and from Shoreham’s grass, but this story tells about the less well known characters that have made Shoreham the well respected airport that it is today. Harold Piffard, the first person to fly a heavier-than-air powered flying machine over Sussex, created local public interest in flying, Cecil and Eric Pashley, the two brothers who put Shoreham on the aviation map, and Fred, George and Blossom Miles, the family that kept the airport operational during those lean years after the Second World War.